If you are looking to increase your productivity, focus, alertness and support cognitive function then Bode Pro Happy may be an option. Oh yes I did not mention that most of use are also energy riddled and want to increase our energy level. We have times in our lives where we are just low on energy or we may just have a downtime in the middle of the afternoon or early evening. Work, family, workouts and relationship can all be enhanced if we are happy. Most everything is affected when we are happy. Something new has come on the market called Bode Pro Happy, also know as Bod•ē Happy. It is based on a popular supplements, widely use in Europe, label as nootropics. This is absolutely exploding and Bode Pro Happy is gaining an affordable edge into the market. Multi-tasking … piece of cake … especially when your mind is clear and you are full of energy. 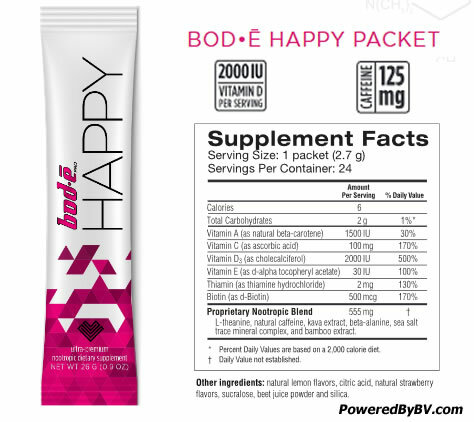 Bode Pro Happy is a delicious way to gain that mental edge in this demanding world of multi-tasking. Shake the can gently and it is best served cold. The recommendation is drink one daily as a dietary supplement. We must indicate to you that if you are pregnant, nursing or have a medical condition (including liver) you must consult your family physician or healthcare provider to using Bode Happy. If you are 18 years or younger it is not recommend … also individuals who frequently consume alcohol, Bode Happy is not recommended. With any allergic reaction stop immediately. If the safety seal is broken do not use and it is best to store in a cool, dry place out of direct sunlight. 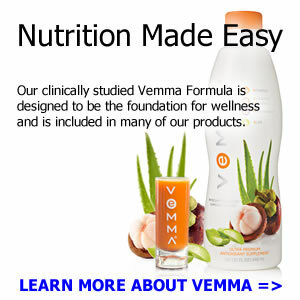 Mix with cold, purified water … 12-14 ounces as this product is concentrated. As you drink Bode Happy, keep shaking. Again the recommendation is to take one daily and the pregnancy, nursing, liver, age, alcohol, allergic reaction. Keep cool and dry and do not use if the safety seal is broken. Bode Pro Happy is sweetened with sucralose derived from natural cane sugar. It is approved for use in over 80 countries and deemed appropriate for use by authorities as the World Health Organization (WHO), U.S. Food and Drug Administration (FDA) and the European Food Safety Authority (EFSA). Bode Pro Happy is manufactured at a facility that meets FDA manufacturing standards call Good Manufacturing Practices. This ensures Bode Happy meets the highest quality possible. Body Happy does not contain narcotics or alcohol but it is not recommended to be mixed with alcohol. *These statements have not been evaluated by the Food and Drug Administration. This product is not intended for diagnose, treat, cure or prevent and disease. Is this canned product still available? I am grateful to you for all these efforts you have made for me. I am retired so I have time to work with you but let’s go slowly because we here we will have to look for our means of self-fulfillment every day that God does what is not easy. I count on you and God to make our relationships last. Welcome I appreciate your products but speak to me in length and breadth. They must be excellent. Please provide us with a French translation system for us. 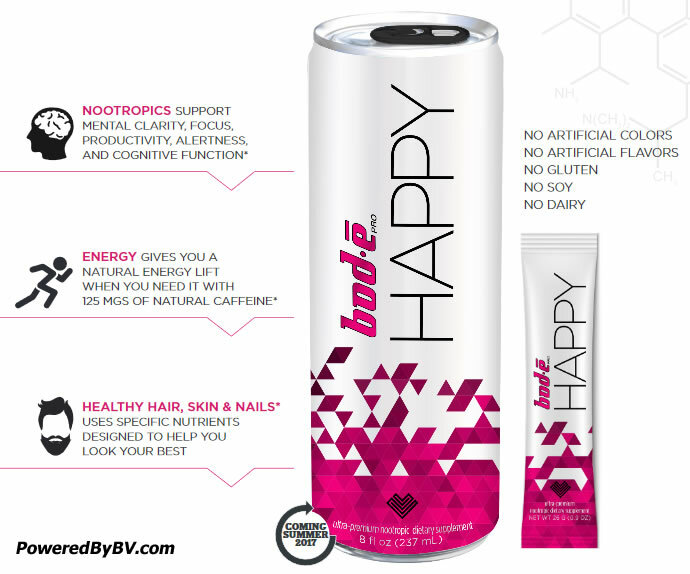 Bode Happy is an awesome nootropic product loaded with nutrition!